Americans weren’t supposed to drink at all during Prohibition, but that’s not how things worked out: just as Congress amended the Constitution to keep their countrymen dry (while a bootlegger known as The Man in the Green Hat helped keep wet bars well-stocked on Capitol Hill), “cocktail culture” as we know it was born. The Bloody Mary, sleek chrome cocktail shakers, hip flasks and streamlined bar carts, craft mixology, and hundreds of other essentials of modern drinking life owe their origins to the dark days and boozy nights of the Dry Years. 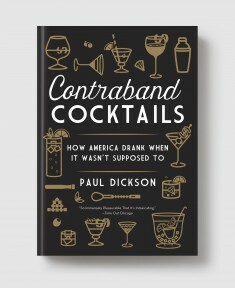 Rich with history, political intrigue, and cultural curiosities, in Contraband Cocktails Paul Dickson pours us an intoxicating narrative of how Americans drank during Prohibition. PAUL DICKSON is the author of more than 65 books and hundreds articles that focus on the American language, baseball, and 20th Century history. His previous book for Melville House was Drunk: The Drinker’s Dictionary, which contains 2,985 words for various states of intoxication and was recognized by the Guinness Book of World Records as the largest-ever collection of synonyms. He lives in Garrett Park, Maryland, with his wife, Nancy. Read more about him at www.pauldicksonbooks.com.